Sometimes we face problems that look very simple at first sight but reveal to be complicated to code. Network clustering is one of those: with patience, anyone can manually pool all the nodes of a network into connex sets by "manually" following all the links one by one. But when it comes to write a script that reproduces this simple strategy, finding an elegant and efficient code is far from obvious. Actually the problem is related to labelling connected-components and anyone that has already tried to code this basic computer vision task knows what I'm talking of. The main output of this piece of code is the adjacency matrix $A$. It is an array that contains all the information about the network connectivity. Note that I use sparse matrices by default, to push back the problems related to the large size limit. 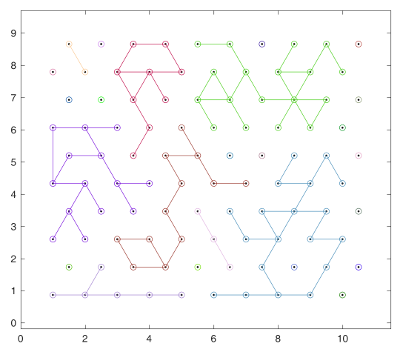 Though adjacency matrices do not have to be symmetrical, making clusters require that "connections" are reciprocal. Otherwise the algorithm's output might be different between executions, depending on the algorithm or the seed. To prevent from this, the adjacency matrices are automatically symmetrized in all proposed methods. Thus, the adjacency matrix that is this passed to the adj2cluster functions doe not have to be symmetrical, but the user should know that it will be symmetrized during the execution of the function. Random links (p=0.25) on a hexagonal mesh create a loose network. 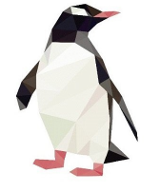 Clusters have been found and colored. To fasten the execution time, it would be beneficial to transform the matrix to work with in a form that is easier to process. For instance, if all nodes were connected to all other node of the cluster, it would be fairly easier. To this aims, one can use the fact that the powers of the adjacency matrix give the number of walks between any two vertices ; by summing all the powers of the adjacency matrix $R_q = A + A^2 + ... + A^q$ up to the point where no more $R_q(i,j)$ term becomes non-zero, one gets a network with fully-connected clusters. As you will see in the benchmark section, this method is faster than brute force. But wait a moment, there is a third method. 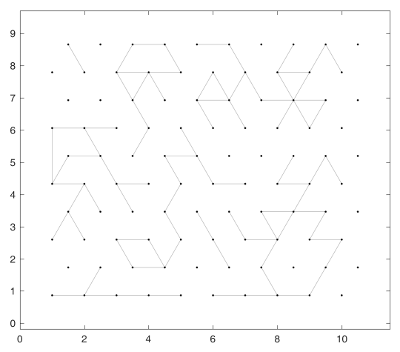 Another idea is to reorder the adjacency matrix in a diagonal-by-blocks form. Many algorithms can do that, but the reverse Cuthill-McKee algorithm works very well in our case since the blocks are directly the clusters. Icing on the cake: it is already implemented with the built-in symrcm function, and it works natively with sparse matrices ! Benchmark of execution times for the three methods on a regular desktop machine. Each data point is averaged over 100 realizations. 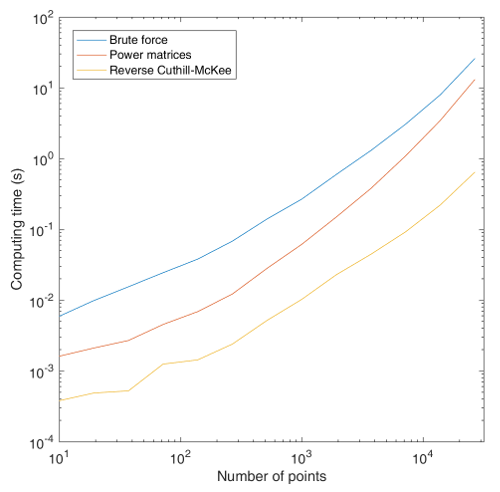 As you can see, the third method is much faster, with an average 5-fold gain with respect to the "Power matrices" method and an average 30-fold gain as compared to brute force. But it may not be completely optimized, and I think one could still find a faster way. So this is an open challenge: can you find a more efficient implementation? The code of the third method (the fastest) can be downloaded on Matlab's File Exchange. Dear Raphaël, Your explanations are clear, simple and straight to the point. The text you shared here, along with the kindly provided code is very useful. I truly enjoyed reading it. Thank you!